Of all the places in England, I keep coming back to Southampton. This is my fourth time now. My journey continues from Swanage to Southampton. Here I will catch the ferry to France-- that is after I make a couple visits. I am in the midst of one of them now. I am visiting with an old Palestinian friend who I met in the West Bank eight years ago. Back then I was working for a Canadian NGO out of the computer science department of the University of Birzeit. We met as he was working on his masters and I on web project. My time in Palestine, a relatively brief 6 months, was hands down the most intense of my life. I was living in the chasm between two cultures in conflict forefront on the world stage. Check points, guns and grenades, soldiers and protesters, the oppressed and the oppressors made up my life. I experienced a personal religious melt down, was caught in the country as it virtualy went to war, and was finally evacuated out by the Canadian embassy. My friend Ashraf is the first Palestinian, that I have managed to meet up with again since my abrubt departure. He is insightfully articulate on everything from religion, to relationships, to England. We share many things in common, in particular having lived such an intense moment together. Yet, beneath how much we agree and how well we get along, we still come from such different upbringings and places. People don't bike and camp out in Palestine for instance! If you think I am crazy, imagine how crazy he must think I am! However, it all makes for great conversation. It certainly beats talking about the weather- a common conversational theme amongst the English! I've told my stories about my time in Palestine so many times over the years that they've started to loose their sheen. Telling them again to Ashraf, someone who was there, gives them new life and new meaning. I sense that the process of sharing these stories with him is really good for me. It was a very difficult and even traumatic time for both of us. But its not just talking that bring back the memories. Ashraf and his wife have revelled me with fabulous hospitality-- in particular a sumptous three or four course, home cooked, palestinian meal, complete with arabic coffee. I LOVE arabic coffee! Perhaps a little too much. Our conversation carried on until 2:30 in the morning! The sun pours in through the windows of the Starbucks. Aside from a few sniffles its a beautiful day. A beautiful day in the port city of Weymouth with Louisa. The fine white sand beach is lined with old houses and stores. The harbour is filled with fancy sail boats and skips. A rare sunny day has the street filled with passerbys and retired English folks out to soak in the warmth. Louisa and I have just come from sitting on the sand eating our sandwiches-- with the fresh salty breeze caressing our skin and blowing through our hair. We leisurely sat watching the boats bob and the children playing in the sand, while the gulls swooped and cawed in hope of a nip of our crusts. I am coming down with a bit of a flu. I hope that the worst is over. Nonetheless it taints my moments with a certain hazy lightness. It adds to the feeling that this is all a dream. My coffee now waits patiently besides me. Louisa casusally touches my shoulder as she looks out the window. James Brown jives on the stereo. The sun continues to shine. Its really rather astounding. When I began my cycling journey, I certainly never expected I would be enjoying a good old Sunday roast-- if anything an endless array of solitary meals on my little camp stove. Sunday Roasts are a near forgotten family tradition for me. I fondly remember sitting around the dinner table while my dad carved up a lamb or beef roast as the mashed potatoes were passed around the table amongst my clamoring brothers and sisters. Yet, there it was, in all its dazzling splendour before me. My friend had just served up a roast leg of lamb, garnished with caraway jacket potatoes, beans, carrots and a tremendously decadent gravy. We all clinked wine glasses and toasted to "Russell"-- an apropos toast as his name is also Russell. I happen to LOVE lamb. Russell's did not disapoint. The lamb was done to perfection in the tradition of Russell's own Welsh family recipe. What a wonderful meal. It won't be forgotten anytime soon. But it wasn't just the food. I have been staying with a handful of English folk who work at a hostel here in Swanage. They all live together in a large communal house. I've been here the two weeks, and they've opened up gracefully to let me stay in their midst. The cooking has been going on back and forth-- the other week I cooked up some of my famous Canadian Potatoe Soup (see the Maier family recipe) the other weekend as we played a game of scrabble. Its been all been an unbeleivably rich immersion into English culture. You simply can't plan or even pay for something like this! The meals have just been one of many great experiences getting to know these folks. When I travel I love meeting people. Staying and making friends with these great folks has not only a culinary experience, but an experience in English accents, television, comedy, humour, and... love. Massive Misfortune... or is that Fortune? 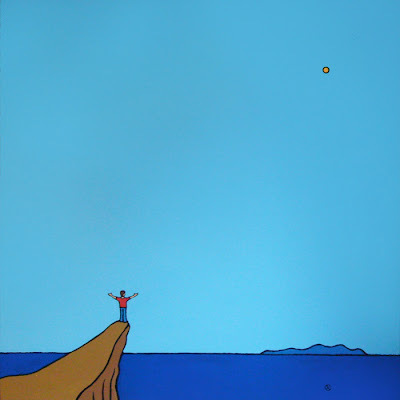 A good friend, recently commented that all I seem to write about is good news. Well, Vaughn, today I can write about some bad news! But, before I launch in, I must clarify, that I haven't had much bad news of late. Misfortune has had a strange and much abundant tendency of turning from bad to good... given a little patience. I write this from outside the Apple Store in Southampton, UK. My Macbook was damaged by dampness last week-- this would be perhaps the most cataclysmically bad thing for a traveling artist/cyclist-- yet it has turned into the most joyful and luminous of adventures. 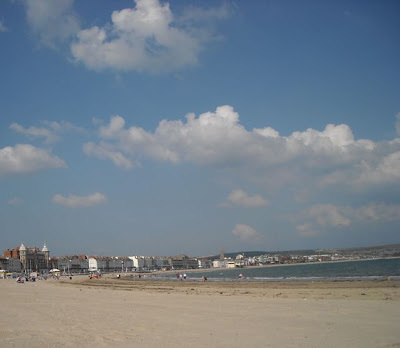 I have been waiting the fix of my Macbook in the small Seaside town of Swanage. In my time here, I have been shown a great time by a beautiful English lass-- from castles to coastal cliffs. I now type, with great relief, on my fixed macbook. Incredibly, a providential visit to Southampton enable me to have my laptop fixed with two days left on the warranty. Allejuia! I cannot get over how stupendously blessed I am. But yes... back to today. HOLY MOLY... who would have thought that a little tiny hole could cause such grief? I small flat took SEVEN tries to patch. A jaunt of 16 kms took 5 hours as I went from one patch and pump to the next. Running out of patches, loosing my valve adapter, and yes, some prolific cursing. I met more English people today than in the whole last week however, as my circumstances invited all sorts of people to stop and offer me assistance. Basically the universe put me to work today, to give people a chance to help a stranger! So, here I am, delayed an extra day on my trip to Southampton. Its getting dark, but thank goodness, my tire is finally holding air. No proof reading of this entry! I will be camping in the Dorset New Forest tonight with the deer and wild horses and silver moon. There hasn't been much word from me of later. My computer has met with a damp demise in two unrelenting days of rain cycling towards the coast and France. I write from the mac store on a display computer as the great geniuses here deal with my disaster. on my much missed computer. In June, I completed the third chapter of my Four Seasons Mural at the Bulkley Lodge. Its completion was my final act before departing Smithers. I literally closed up my paint, washed my hands and jumped on my bike down the highway. My momentum from this departure continues yet. The mural was a two year long project. The fourth season, waits as a possibility in the future. For the moment, finishing Fall, felt like a momentous conclusion. Sitting in front of the mural with an inquisitive friend, the depth to which this mural had become part of my life became clear. Jarrett: "That guy looks a little like you Russell". It was only then that it hit me. It now seems proposterous that I didn't realize it while I painted, but i can see now how mural not only depicted the Bulkley Vailley, but had become a reflection of my life in it. My partner, the kids, our home, our apple tree, our cat, all play themselves out in 5 x 15 foot splendour. The idea behind the mural was to bring colour and light to the living area of the seniors. You should have seen the wall paper that my mural covered up! Floral blandness in the extreme. The seniors who live in this area of the home suffer from dementia. They have minimal intellectual capacities and for this reason seldom leave their building, let alone the town. Most of them spent their lives in the valley, partaking in the flow of the seasons and community. The goal was to create an immersive mural to enrich the space where many will spend their remaining years. The underlying personal catalyst behind beginning the mural was a way to address fear. I had asked myself that New Years: "What do I fear?" One answer was death, aging and, symbolically, seniors homes! What better way for an artist to confront such a fear than to paint a mural in a seniors home. The two year experience was profound. Eric, one of the residents and I got along particularly well. Eric, helped me on a regular basis-- holding my brushes or simply greeting me with his indefatigable smile. Barely able to say more than a word or two, where others would be down and defeated by their condition, Eric was always there to help and to smile. The simple beauty of his intention was a powerful example. You don't need fancy words, web pages, or even paintings to inspire. You just need a smile. 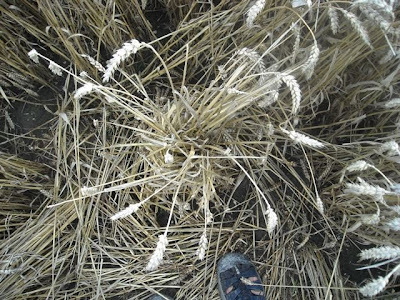 The wheat inseparably woven together in the center of a circle. There are several reasons why I find myself now in England. One is that the cheapest ticket from New York City to Europe that I could find was through London. The other, and I would add, much more significant, is that my fascination with mandalas began with a book on crop circles. 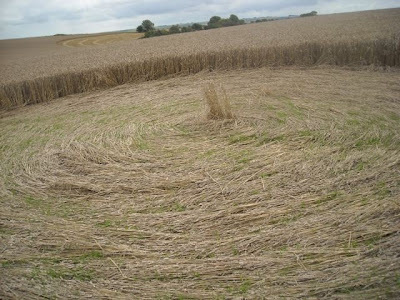 Crop circles in the most amazing mandalic patterns have been appearing in English fields with increasing complexity over the last decade. The other day, I found myself in my first crop circle. Cycling along throught the countryside, I noticed a couple walking down a footpath on the side of the road. I stopped, mainly to take a photo of the rolling fields around me. In the distance I I noticed the couple vear off the foot path into the field and over the horizon. Hmmm... what lead them that way? I followed their footsteps. As I turned into the field and crested the hill-- there it was. A gigantic pattern over 300 metres in length. I immediately recognized it as one of the very patterns I had read about only a week ago while in NYC. The article had inspired me to aim my trajectory to Whiltshire. And there it was. It was if it had found me. Walking through the field, a certain stillness falls over me. It could have been just the vastness of the field, and the slight breeze rustling the wheat. It is a whole different experiencing a circle on the ground, rather than from a book's arial photo. The lay of the wheat was trully impressive. The wheat is pressed down in smooth spiral. There is no awkwardness to the press, it flows smoothly without begining or end. Even the small drops off the sides of the circles where pressed down with tips that ended with a resolution of one or two heads of wheat. Most impressive of all are the center of the circles. The spiralling pattern of the grand circle spirals into to a perfect centre. The stalks of wheat wind together in the centre in a perfectly tangled bouquet. That said, there were several parts of the circle that seemed to lack the overall general perfection of the rest. The drops weren't quite as smoothly tappered as one would think. Of course, two weeks had gone by since the pattern was first discovered. The size, symetry and geometry of the circle were the most impressive however. Its a fantastically engaging pattern. 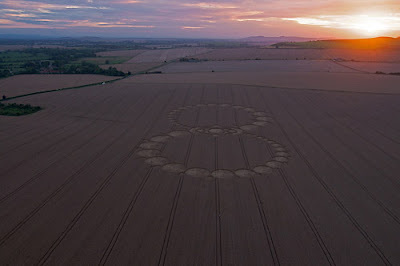 The circle also appeared on 8/8/08. This circle of course is just one of many this summer. From a nearby hill I could spy three others. One was definitely man made. The other two, like many others that have been appearing, incorporate such mindblowly beautiful and simple geometry, that one can't but shake one's head. In Star Trek, the crew of the enterprise visited other planets following the Prime Directive: Don't interfere. If there's a higher intelligence behind these, all I can do is clap my hands. What a fantastically brilliant way to assist humanity raise its consciousness without interfering. Me writing this blog, you thinking about it, the conversations that ensue, the vibration is increasing. 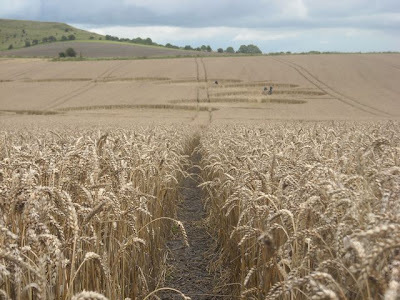 And all that has been bent out of place are some stalks of wheat. 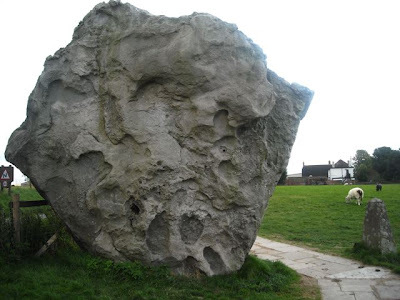 After my experience at Stonehenge (see previous post), I continued onwards to Avebury. Avebury is a larger and older stone circle. It isn't nearly as commercialized. Its still free to visit and you can still walk around and touch the stones. I arrived in the evening, camped, then spent most of the next day there. It may sound a little silly but I shared with the stones my intention of building a grand mandala with the people of the planet. The stones had a gravity to them, that seemed beyond their physical and material prescence. I meditated beneath them. Working at table in the center of the circle, I had a break through in my logo design work for the mandala project. The new logo is composed of the numeral '1' arrange in a mandala circle. Just like Avebury's circle of standing stones. What a great inspiration the day and the place proved to be. That's what mandalas are all about. Humanity has been engaged in making circles for a long time. Carl Jung points out how natural they are to make, and how circular patterns find themselves in virtually every culture under the sun of history and geography. As a mandala artist, how could I miss the opportunity to see some of the world's oldest and most famous circles? My tour of England has inevitably included a pilgrimage to Stonehenge and to Avebury. Stonehenge actually wasn't as profound an experience as one would think. It was inundated with buses, traffic and tourists. Even if one paid the $16 fee, one couldn't actually get close to or touch the stones. My experience was strongest approaching stonehenge. 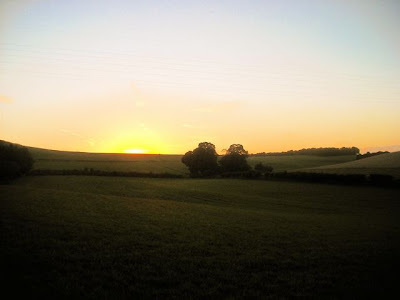 The night before I had camped on a lonely hill top overlooking the henge two kilometres away. Th next morning, instead of arriving on the insanely busy highway that all the buses and tourist come on, I came over the hills on a lonely footpath. I had the path and fields all to myself. Slowly, I made my way through the ancient mounds and the ancient topography. Over the last hill, there stood stone henge, looming massively on the horizon. The parking lot and buses couldn't be seen. I could feel how impressive it must have been for an ancient pilgrim. I was there, back thousands of years ago. Arriving at the tourist walkabout, and unable to touch the stones, I felt my pilgrimage was incomplete. 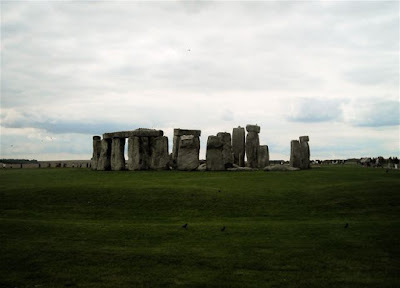 A friend had spoken of the importance of listening to the stones, of connecting with their ancient energy collecting the visits and touches of hundreds of generations of humans.